The ONS compile Supply-Use Tables (SUTs) for the UK each year. Amongst other information, SUTs split out each component of final expenditure (household consumption, investment etc) into spending on 104 different categories of goods and services. For instance, of the £1,126bn in total spent by households on consumption in 2014, around £12.9bn was on furniture. They also do this for intermediate consumption – purchases of goods or services by firms made in order to supply their own products. For instance, in 2014, firms in the finance and insurance industries spent around £4.1bn on legal services, and firms in the economy as a whole spent around £25.5bn of intermediate consumption on legal services. 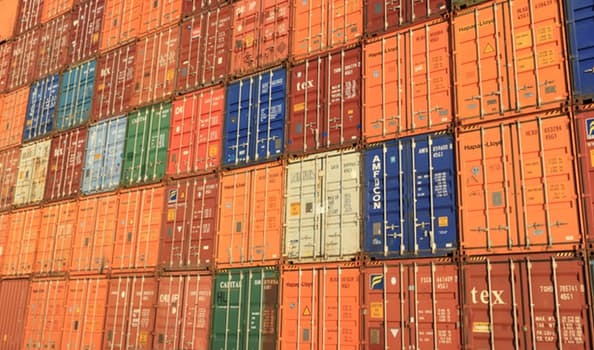 SUTs also tell us the import share for each product category: the proportion of the total amount spent on each product that is supplied from abroad. This information can be used to carry out an Oaxaca decomposition which splits changes in the aggregate import share into ‘between product’ and ‘within product’ effects. For example, imagine an economy that consists of two sectors: motor vehicles and insurance services. A large proportion – say 50% – of motor vehicles are imported, whereas only 10% of insurance services are provided from overseas. Suppose that the proportion spent on cars increases from 50% to 60% (and the proportion spent on insurance services drops from 50% to 40%). Even though the import share of each sector has stayed the same, the import share of the economy as a whole has increased from 30% (0.5*0.5 + 0.5*0.1) to 34% (0.6*0.5 + 0.4*0.1). This is a ‘between product’ – or ‘compositional’ – effect. In contrast, suppose that the shares of expenditure on cars and insurance in this imaginary economy stay at 50:50, but the import share of cars rises from 50% to 55%, and the import share of insurance from 10% to 15%. The import share of the economy as a whole has increased from 30% to 35% (0.5*0.55 + 0.5*0.15). This is a ‘within product’ effect. The change in import share of the economy as a whole can be split between these ‘between’ and ‘within’ effects. Why does this distinction matter? Compositional effects on import intensity can happen for many reasons, often unrelated to trade. For instance, suppose the government reduces expenditure on healthcare – which has low import intensity – and cuts taxes. If households spend the tax cut on high import intensity goods and services (for instance, cars and holidays), then the average import intensity of spending in the economy will rise. But this increase in import intensity has nothing to do with the exchange rate. Stripping out compositional effects gives a more ‘pure’ measure of import intensity as driven by exchange rate or other trade-related factors. There are some caveats. Firstly, the decomposition assumes that a category of goods or services has the same import share regardless of the category of expenditure it is supplied for. For example, suppose ‘motor vehicles’ in our fictional economy includes both cars purchased by consumers (household consumption), of which only 25% are imported, and vans purchased by businesses (investment), of which 75% are imported. If total expenditure on vehicles stays the same, but more of it consists of investment spending (vans) and less household consumption (cars), then the import share will rise. Really, this is a between effect that results from the shift from consumption to investment expenditure. But because it only uses the import share of vehicles as a whole, not of cars and vans separately, the Oaxaca decomposition will describe this as a within effect. The same issue means that the split of compositional effects between intermediate and final expenditure (see below) is only an approximation. Figure 1 shows how changes in the aggregate import intensity over three year periods were driven by between and within effects. Between effects have been split between those arising from changes in final expenditure and intermediate expenditure. Source: ONS and author’s calculations. Aggregate import share is imports/gross output. Import shares are calculated at basic prices. Changes due to indirect taxes and subsidies are included in final between effects, changes due to distributor’s trading margins are included in intermediate between effects. Both of these components are small. Overall import intensity increased between 1998 and 2011, before declining over 2012-14. But the behaviour of the aggregate import share disguises the underlying dynamics. In the period following the large appreciation of sterling in 1997, within effects pushed up on import intensity – for any given product, the share of gross demand met by imports rose – which is intuitive since imports became cheaper relative to domestically produced alternatives. After the depreciation of sterling in 2008/09, however, the within effect began to act as a drag on import intensity, as imports became relatively more expensive. These within effects arguably indicate the effect that exchange rate movements have on the import intensity of the economy – as well as other more global factors such as developments in trade openness associated with global value chains. But the within effects were partly masked by changes in the composition of spending between products. 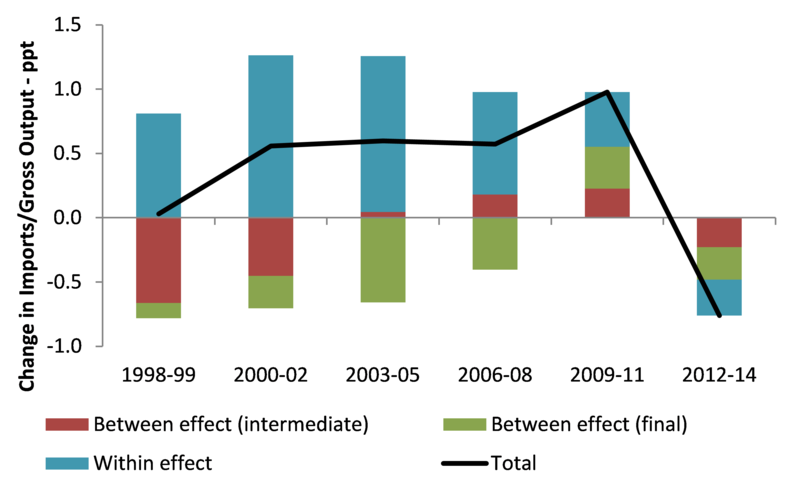 Changes in the composition of spending offset some of the increase in import intensity within products over 1998-2008. These compositional changes then provided a boost to import intensity in 2009-11, before acting as a drag in 2012-14. 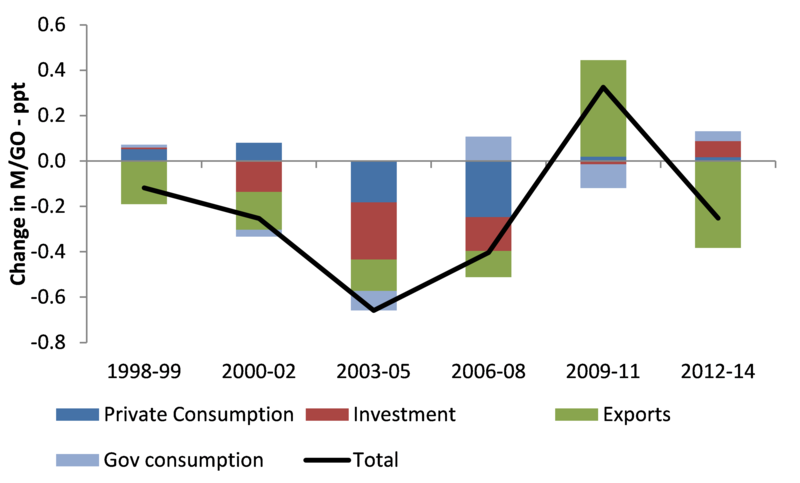 Why did compositional effects boost imports in 2009-11? Figure 2 shows the contributions of each category of (final) expenditure to the overall between effect. These between effects can reflect responses to the real exchange rate, but also to other shocks affecting the economy. Source: ONS and author’s calculations. Non-profit institutions serving households are included in private consumption. Changes due to indirect taxes and subsidies are included in government consumption. Valuables and changes in inventories are included in investment. There are three factors behind the turnaround in between effects. Firstly, strong growth in government current spending (which tends to be on services with low import share) on average supressed aggregate import share up to 2009. From 2010, this went into reverse as fiscal consolidation began. Secondly, up to 2007 the behaviour of exports generally reduced import share – services exports (which are much less import-intensive) grew faster in nominal terms than goods exports. From 2008, nominal growth in services exports slumped, whilst growth in goods exports slightly improved relative to the preceding decade. This illustrates how exchange rate movements can have perverse effects on import intensity; if they stimulate price-sensitive exports that have high import share, this will increase aggregate import intensity. Thirdly, up to 2009 there was a negative compositional effect on import intensity from private domestic demand. After 2009, this disappeared – investment and private consumption actually boosted import intensity slightly. For investment, this may be related to the boom and bust in corporate real estate (CRE). 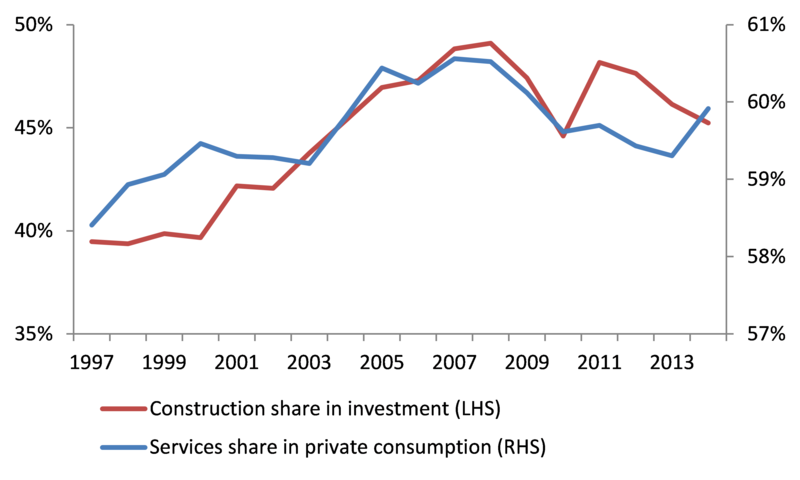 Spending on construction – which has low import share – peaked as a share of investment in 2008, and has fallen since (Figure 3). For private consumption, there was a halt in the pre-crisis trend towards services taking a larger share of nominal spending. As real incomes were squeezed, spending on consumer services may have been first to be crowded out. Source: ONS and author’s calculations. What does this mean for UK import growth now, after the significant depreciation seen since early 2016? If exports respond to the depreciation, that is likely to boost the import share again, particularly if services are less price responsive than goods. The OBR forecast government consumption to continue falling as a share of GDP over the next 5 years, at a pace only slightly slower as that from its peak in late 2009. However, a turn in the CRE cycle as sharp as that during the financial crisis would be surprising, and there is unlikely to be a repeat of the sharp fall in productivity seen from 2008 onwards. Changes in the composition of expenditure at a product level do not seem to be an important part of the response of imports to the exchange rate – at least not following the 1997 appreciation or 2008-09 depreciation. If anything, these compositional effects can mask the process of import substitution at a within product level. This doesn’t negate the import substitution effects of an exchange rate depreciation – it just makes them harder to observe.